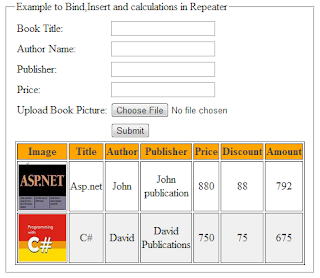 Introduction: In this article I am going to explain with example How to Bind, Insert and perform run time operations to calculate discount and total amount in Repeater data control in asp.net using both C# and VB.net languages. Description: In previous articles i explained How to bind, edit, update and delete data in Repeater and Custom paging in Repeater control and Bind,Save,Edit,Update,Cancel,Delete,Paging example in GridView and How to Bind,save,edit,update,delete records from DataList and Bind,Save,Edit,Update,Cancel,Delete and paging example in DetailsView and Retain password value in the asp.net TextBox after postback event and Bind,upload,download,delete image files from the GridView and jQuery to validate file extension and upload image file. In this article I have demonstrated the way to perform run time calculations. Suppose there is a fixed book price and 10% discount on the book price, then we can calculate the discounted price on run time and display in the repeater directly without storing the discounted price in the database. Implementation: Let's create a sample asp.net website to see the repeater operation in action. First of all create a database in Sql server with the name e.g. "dbBooks" and in this database create a table with the columns and the data type as shown below. Also create the stored procedure in Sql server to bind the Book details in Repeater control. Note: Replace the Data Source and the Initial Catalog as per your application. Note: Create a folder in the root directory of your website and name it "BookImages". This folder will contain all the uploaded book images. I want to make page like facebook in which i post soma data or message to other . What can i use for data , It's Grid View or List View.? You can use datalist,repeater,listview etc..